People often ask me what is ‘the one thing' that it takes to achieve excellent exam results. But, actually all these things just help people to do the true ‘one thing' that it takes to get amazing grades. What is it? In this blog post I'm going to talk about some of the ways that you can help your child to be consistent and get the grades they truly deserve. Consistency matters because lots of small actions taken over a long period of time really do build up. When I ask students at the end of the session, one of the most common take-aways they have is how powerful the five minute revision challenge can be. I think this all comes down to two of my favourite quotes. 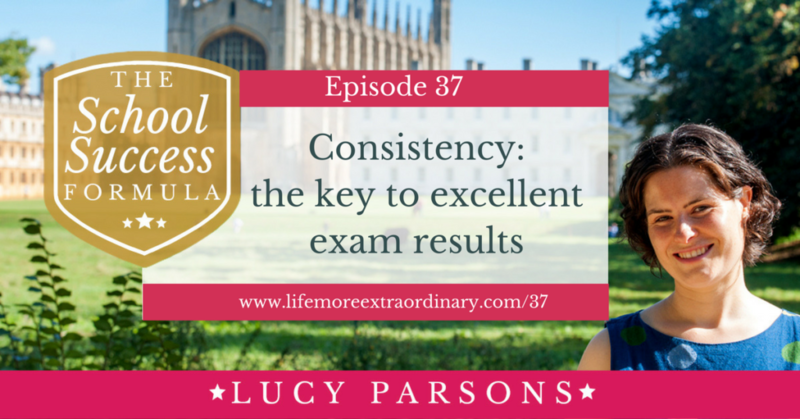 Basically, if you consistently work towards your exams you can expect to achieve great results. I might caveat this with, if you consistently work towards your exams in the right way you can expect to achieve great results. One of the best ways to be consistent is to put the right amount of time into your studies over an extended period. Over the long-term I suggest that all students do this by following a weekly routine. This is what I did when I was in the latter stages of year 11 and throughout my A Level study. Every week I ensured I was investing an appropriate amount of time, and therefore effort, into my studies and it paid off big time. I got five As in my A Levels and into Cambridge University. Even if your child hasn't been following a weekly routine until now, it's never too late to start. And, if you're worried about your child having some balance in revision and exam season it's a great way to map out time off, some fun, exercise and enough sleep to support them with all this learning. 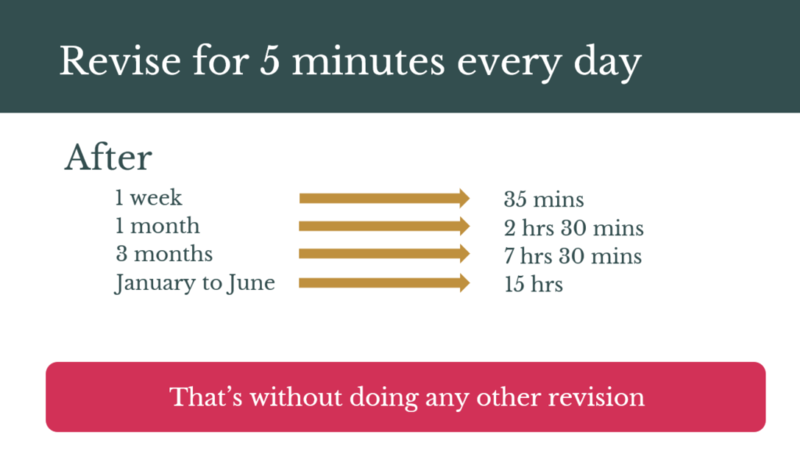 Over the short-term I think it's really effective to think about the opportunity that the five minute revision challenge brings. By using even the shortest bits of time to revise, if you do it consistently, your knowledge, understanding and skills can really build up over time. This is really about a mindset of opportunity. For example, lots of the students I work with have very long journeys to school. How can they use their bus journey for revision? What do they need to put in place to make effective use of that time? As I say to my clients, turn that ‘I can't…' attitude into ‘I can…' and it's amazing what can be done. We’ve found there is a strong link between the kind of revision someone does and the outcomes they get. So, which student will do better in an exam? Student 1 does fifteen hours revision – all of it reading through class notes. Student 2 only does ten hours revision – two hours making mind-maps, two hours creating flashcards of key terms, three hours writing timed essays, two hours working through past papers and looking for patterns in the questions asked, and half an hour doing the hardest question they could find, followed by half an hour talking it through with their teacher. Then they spend five hours shopping with their friends and watching TV. If you're looking for the right kind of work, start with The Revision Power Hour and then get your child to check out the Examiners' Reports on the exam board website (click here for a video showing you how to find the Examiners' Reports). Traditionally, students left revision until the very last minute then did all-nighters cramming for the exam. This is not the answer, if for no other reason that you need a good night's sleep in order to think on your feet in the exam and to learn effectively. Tired brains don't learn nearly as well as fresh, well-rested brains. Students will achieve so much better in their exams if they take the long-term consistent approach than if they leave it all to cramming. Creating a structure around the tasks that need to be done – essentially a routine, or even a revision timetable. Routines, structures, timetables and plans (whichever you want to call them) work because they stop things falling through the cracks. So, if your child knows they're going to do their five minutes of revision when they get home from school, after they've had a snack and before they get on with their homework and it becomes a habit, then it's going to happen and it's going to be consistent. However, if they don't anchor this activity and connect it to a time of day it's likely to drift, be left until the end of the day and not happen. Then, because it hasn't happened today it feels less important to do it tomorrow and time will drift on with no consistency. What can you take away with you today? In the comments below, on Twitter, or in my Facebook group for parents (the Supportive Parents, Successful Students Community) I'd love to hear what your greatest takeaway has been from this post / episode. I love hearing from you so don't be shy and I reply to everyone as soon as I possibly can. Need some help putting a consistent revision plan in place? You can now get access to a recording of my Revision Kickstarter workshop anytime you want it. The workshop is a very practical two hour session that will guide your child through creating a personalised revision plan of their own, identifying how they learn best and introducing them to ideas such as the five minute revision challenge, and other similar ideas, that will help them to revise efficiently, effectively and consistently.